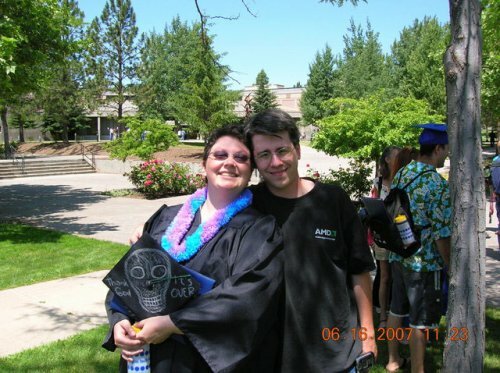 My fiance Paul and I have been together for three years.&bsp; We met online through the http://orlug.borked.usOregon Linux Users Group... ohhh yes, we're nerdy.&bsp; When we first met, we were seeing other people and had no interest in each other romantically. I was dumped two weeks before I was to move to Corvallis from Klamath Falls, and as soon as I'd finished moving, Paul drove from Portland and visited me nearly every weekend just to hang out and explore, as I lived within stumbling distance of six bars. About a month after I moved, Paul's girlfriend dumped him for another woman via text message. Naturally, we just sort of gravitated toward each other, and we've been together ever since. He proposed in our favorite Corvallis bar! We haven't set a wedding date yet, we're probably going to wait until we move to Canada. I'm a 5'8", 300-pound x-ray tech with a bachelor's degree from Oregon Tech, and Paul's a 5'10", 175-pound civil engineering/survey technology student. Just more living proof that people CAN be fat, smart, successful, and find love!